The vivid photos and stories of humanitarian work in Africa shared by a group of returning Catholic missionaries was enough to set Jouseth on her career path. “Josie,” as she is known by friends, was still an impressionable Quito, Ecuador teen devoted to helping others, when she opted to become a doctor. “Helping people was my desire. I was in Catholic school and they talked about missionaries going around the world and reaching out to others. I thought I could do my part by becoming a doctor,” Josie said. But first she had to complete eight years at Central University of Ecuador Medical School, and all of its grueling demands, from which only 17-percent of her class would make it to graduation. There were exhausting nights the medical student spent in the Neo Natal Infant Care Unit (NICU) of a children’s hospital, where she was responsible for drawing blood from and performing spinal taps on 25 children in her care. “I never slept when I was in that department. I had to take blood from my little patients with tiny arms. They are hooked up to lots of machines and you have to be very careful not to move anything. Every morning we had to report our results to the doctors,” Josie remembered. Josie’s best experience was in her 6th and 7th year as a student in the oncology department. She graduated, specializing in pediatric oncology, and spent a year working in several departments of a Quito hospital. 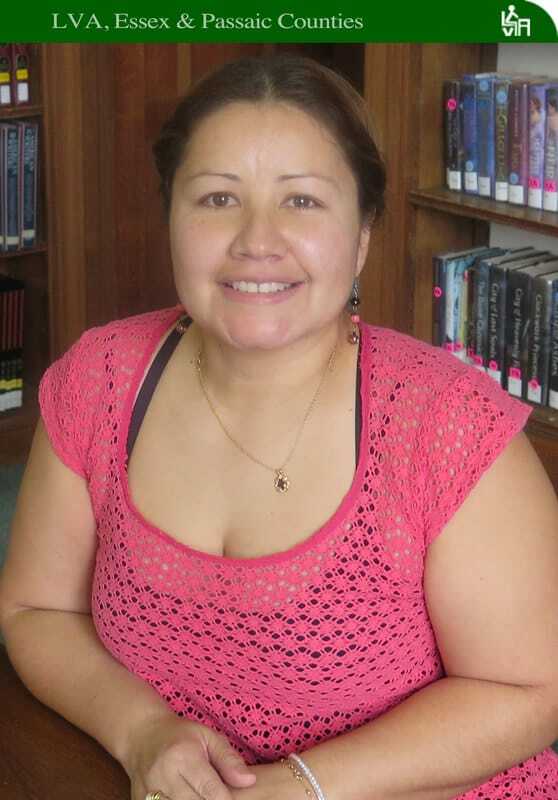 A recession in Ecuador eventually led Josie to the U.S.
She is an advanced ESOL student and one of many professionals who study vigorously with Literacy Volunteers of America in preparation to resume the careers they enjoyed at home. While she studies for her medical exams, Josie works as a writer for a newspaper and a companion for an older woman. She’s married to a man whom she met in med school. Together, they are raising two children, a 15-year-old boy and a girl, age 12. “This is a challenge,” she said. “I have to organize studying, my family, the job. I have to do it. I have faith that I am going to pass the test. Nothing is impossible,” Josie stated. Damian Wilson is rapidly checking off her list of personal goals. Reading and writing are at the forefront. 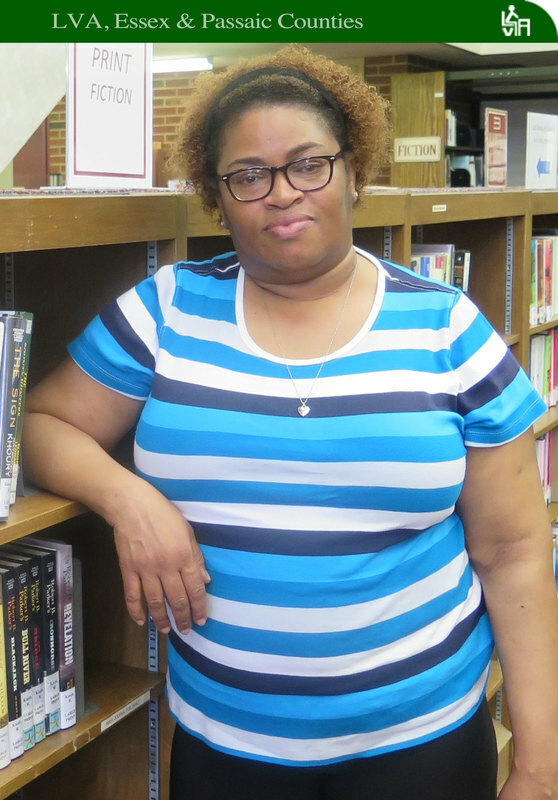 Most recently, she entered New Jersey Association of Lifelong Learning’s Adult Learner Writing Contest and one of her selections was chosen to be showcased in their yearly publication. At one time, this was a far off dream for Damian, but with her determination and the support of her tutor, Margaret Valentine, Damian’s dream became a reality. They meet twice a week for two hours each day and every moment is action packed. Damian said, “I am hungry to learn.” And, Margaret is eager to teach. Damian lived in Jamaica until she was a young teen, and was pushed along the school system through the 8th grade. “I didn’t grasp anything at all, but they let me go through,” she said. With her endless enthusiasm and tireless energy, one would never imagine Damian has overcome monumental health issues. “I had a kidney problem,” she said, “but did not let it hold me back. I scheduled my dialysis so it did not affect my classes.” After a long wait, Damian’s name finally came up on the transplant list and soon she was in surgery. Damian said in her matter of fact way, “I got a kidney transplant and am back in class again. I wasn’t going to let my sickness define me.” Add a big check mark to her list of goals. Kathy and Geneiva Carter are a class act. In fact, they are a class sister act. 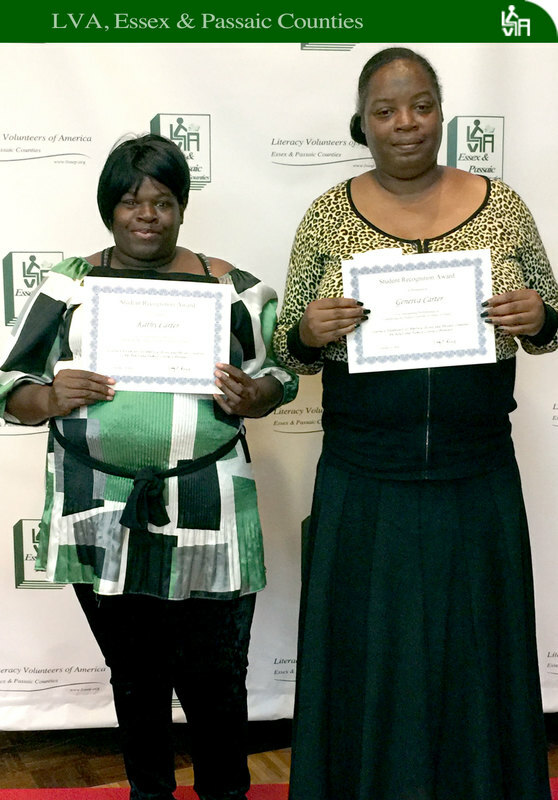 These two ladies have been studying English for two years with their LVA tutor, Patricia, and the three have become an inseparable trio. Being raised in New Jersey by an illiterate mother, Kathy and Geneiva knew they wanted a better life for themselves and their children. “I needed help in my reading. I would like to improve it, “ Geneiva said. 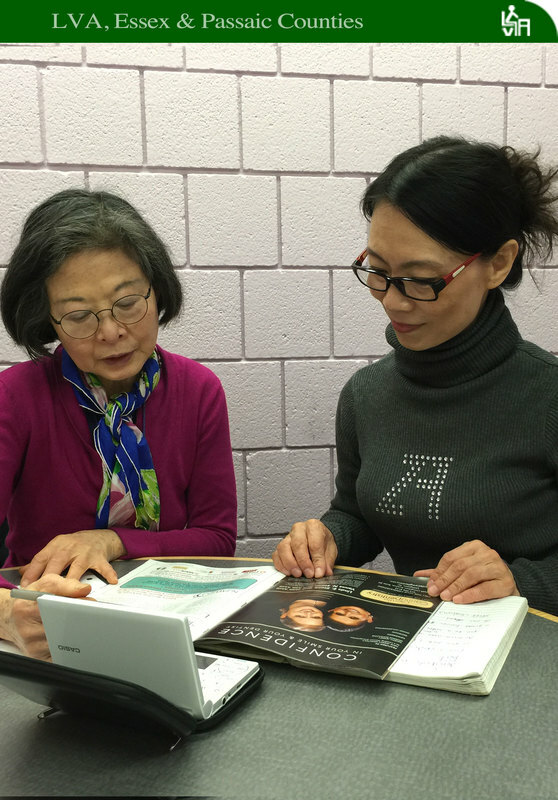 “I just wanted to enhance my comprehension skills and reading ability,” Kathy added. Before the ladies started with Patricia, they were not reading books at all. Both were products of a failing inner city educational system. The first thing their tutor did was to help them get a library card. Recalling this experience brought big smiles to their faces. “Reading is power,” Kathy said. “Knowledge is power,” Geneiva added. “We have improved a lot,” they both nodded in agreement. Church is a big part of Kathy’s and Geneiva’s lives and they enjoy reading spiritual and devotional books. “I like to read books by Joel Osteen and Joyce Meyer,” Geneiva said. “I find myself reading much better when someone is helping me to sound out the words. Every once in a while I give myself a challenge and also try to read short stories,” Kathy said. Along with church, family is of equal importance to Kathy and Geneiva. They have always lived close to each other and now are happy that they both live in the same building. They enjoy telling stories of family meals together. Geneiva’s specialty is spaghetti with Italian sausage, and Kathy’s favorite cuisine is collard greens, macaroni and cheese and turkey wings. “One time I made a ham for Christmas,” Kathy said. Geneiva quickly added, “It wasn’t very good.” They both laughed. Inspired by their children, Kathy and Geneiva want to further their education. “I want to better myself for my grandbaby and help him with school. I want to be there in any kind of way,” Kathy said. Geneiva plans to go back to school and get her high school diploma. If it’s worth having, it’s worth waiting for and no one knows that better than Lily, an LVA student from China who waited two years for help with English. That was five years ago. Since then, she’s crossed off every goal on her to do list and developed a wonderful working relationship with her tutor, a trainer whose mother was never taught to read and write because she was a woman. Also, Lily is living the American dream. Shortly after relocating, she started her own business. Lily has an in home studio where she teaches private piano lessons. Currently she has a roster of 15 students ages 5-12. She teaches the music of Beethoven, Chopin, and Liszt. Her students perform in recitals twice a year. Lily’s love of the arts began in China when she was a child. Her much loved nanny liked singing and took Lily to shows as a toddler. “I danced on my nanny’s lap,” Lily remembers. As a school aged child, Lily attended formal dance classes where she was trained in classical ballet as well as Chinese traditional dancing. Her repertoire also includes folk dances from India. Lily’s passion for movement did not stop as a child. As the mother of a grown daughter, Lily still practices dancing to keep in shape. She also walks at least four times a week for at least one to two hours. In her spare time, she finds opportunities to swim and play tennis. “I like to keep my body flexible,” Lily said. Lily’s commitment to her health does not stop with exercise. Actually, it was Lily’s LVA tutor who also guided her toward healthy eating. Lily loves cooking as well. “My family is vegetarian and we became vegan about three years ago,” she said. A typical breakfast in her home consists of oatmeal with soy milk. “My favorite food is salad,” Lily added. “We change our salads according to what is in season. Winter salads include cooked root vegetables. In winter, we do not eat cold food.” Dinner is often a sumptuous meal of cooked Chinese vegetables, tofu and rice. LVA student Esteban Morales made his mark in the computer industry in his native country of Peru and plans to continue his legacy by writing a book in English. Esteban grew up in Lima, Peru’s capital city. A self- described “homebody,” he was fascinated by computers at a young age. “Someone brought a computer from the U.S. in the early 1980’s. It was a very big, sophisticated computer and that is when I became interested,” Esteban said. After a three-year stint, he took a job at the Nutritional Research Institute as head of the computer department. In the not too distant past, Esteban began programming something else: the mind. He took classes in hypnosis and Neuro Linguistic Programming (NLP). Esteban is currently writing a book on this subject. He sees this as a way of reaching many people at one time. If he makes the strides in his writing that he has in speaking, look for his name on the best-seller list in a few years. In the case of Luz Nelly, who was raised on a coffee farm in Neiva, Colombia and arrived in the U.S. three years ago, the toughest of those encounters took place in local stores. It was there that her attempts to communicate with merchants in English, using a thick foreign accent, turned simple purchases into difficult, even traumatic transactions. Luz Nelly said she tried to remain positive following those verbal confrontations and not let them influence her one way or another. But one thing was clear, she said: Her English needed to improve. “My husband saw a flyer for Literacy Volunteers of America in a local library,” Luz Nelly said. So last summer, she enrolled in a beginning-level ESL class offered by LVA at the Montclair Public Library - Bellevue Avenue Library branch. But her academic plans were delayed when, unable to find child care for her 9-year-old daughter and not permitted to bring her to class, Luz Nelly was forced to leave the program just four days later. Luz Nelly completed the 10 week ESL course in early December, emerging as something of a class leader, her teacher said. She is now slated to continue her language studies with LVA in a small group of ESL students. In all she’ll put in 16 hours of class time each month. In addition to her classes, Luz has studied with her primary LVA tutor Sally Fillmore for 15 months, 2 hours per week. 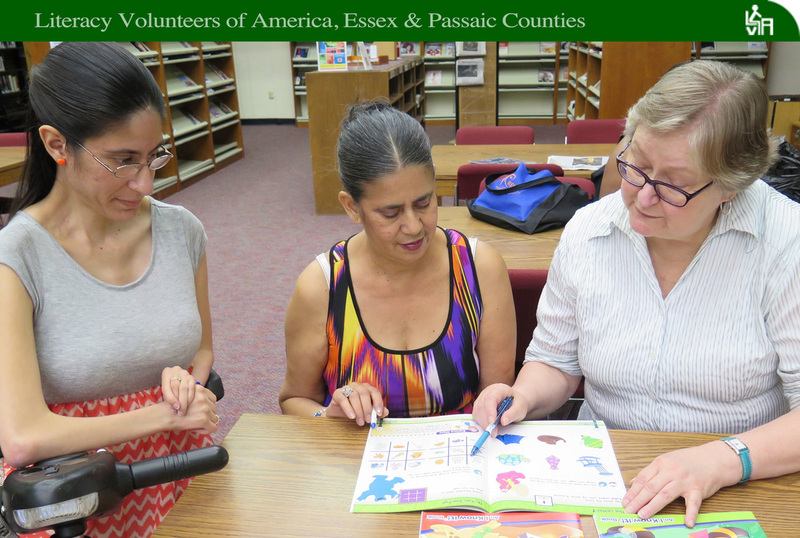 “During that time,” said Sally, “Luz has been studying ESL at Essex County Community College and at her church on Saturday mornings. We often use the books from her classes at the Montclair Library to enhance our lessons. Also she has been studying for the citizenship exam and has memorized all 100 questions and answers. We are working on written work now for that test.” With all of the hard work Luz is doing, it is a given that she will pass. It was a gamble. With three girls, ages 13, 5 and 4, the cost of her husband’s frequent travel to the Dominican Republic where he runs a business, and fees to have her educational transcripts evaluated in the U.S., the family had expenses. It took nearly nine months but, as schools prepped to open in September, Kenny received a call from the Passaic Board of Education, where she’d applied for a job as a substitute. How soon could she start, they wanted to know. Often the biggest obstacle to employment for recent immigrants is English, according to Immigrant Professional Integration, or IMPRINT, a coalition of organizations active in the field of skilled immigrant integration. “Across the board, stronger English language skills were correlated with virtually every possible measure of immigrant economic success,” IMPRINT said in a recent study. Kenny questioned her own English skills, even after attending LVA-sponsored ESL classes at Berkeley College in Newark and the Passaic Public Library, and plenty of self-study. She now averages four days per week in Passaic schools, working as a substitute or assistant teacher in Pre-K, Kindergarten, and 1st grade classes. So far it’s a win-win, for her girls with whom she has plenty of time to spend, and the young students who run up and hug her in the hallways. And it’s reinforced her confidence in her developing language skills. Percy’s older brother worked on the farm as well. Together, they picked and washed mangoes to truck to town and sell at the market, along with their rice. After Percy finished high school, the family left the farm and moved to Lima. They set out for a 14-hour journey by bus with only the clothes they could carry in a few small boxes. Again, without much lapse in time, Percy found work and this time was the sole supporter of his family. “I had been working since I was young, so supporting my family wasn’t difficult,” Percy said. Percy’s first job in the U.S. was washing cars during an extremely cold winter. He knew there must be something better. Percy also improved his speaking skills by watching American television. “I try to memorize how to pronounce words. I practice everyday,” he said. He still helps out his parents in Peru and his son who is now studying computers in college. Percy is not stopping here. “I am sure I can do more things. First of all, I would like to learn more English to have a better career. That is my dream. I think I can do it,” Percy said. 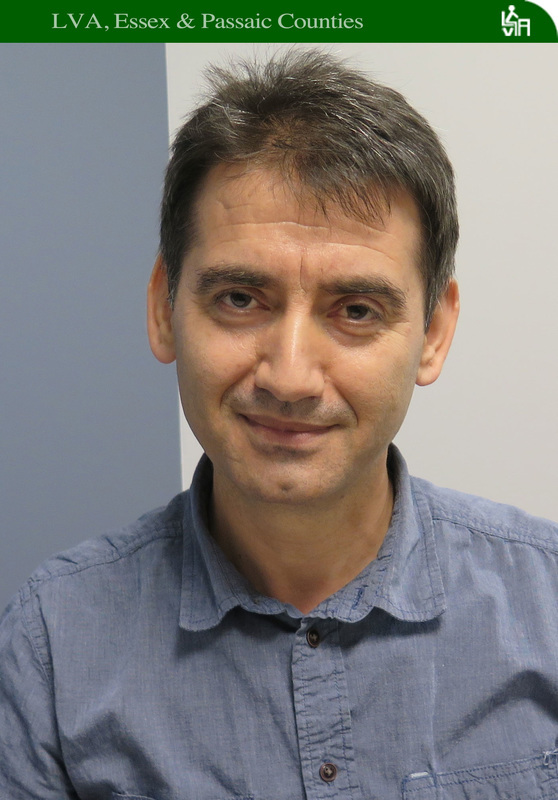 It was the start of an exciting summer for Cemal (pronounced “Je-mal”), a Turkish language scholar and university professor from Istanbul. First he traveled to Boston for his first educational conference abroad. 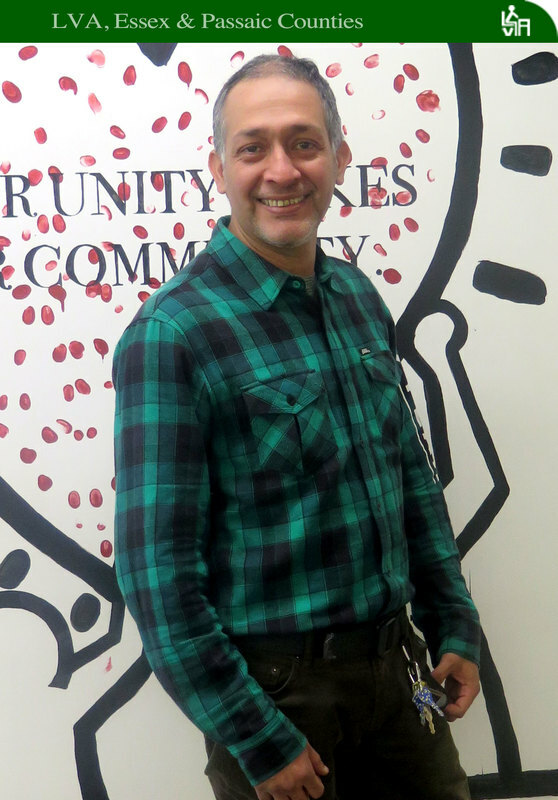 Then he headed to New Jersey to enroll in LVA’s intermediate ESL class at Berkeley College in Newark that started on July 5th. Then all hell broke out back home. On July 15, a rouge faction within the Turkish military staged an attempted coup, which left about 245 people dead and more than 2,000 were wounded. The government quickly regained power and imposed a state emergency. It fired or suspended more than 100,000 civil servants, including judges, prosecutors, and teachers. Another 70,000 people were arrested, including soldiers and journalists. It’s not unusual for foreign students to be seriously affected by events at home but, even as those cases go, Cemal’s is unusual. His passport, a special document issued to educators, was declared invalid and he was ordered home. The scenario is also bleak for his wife, a psychologist, and their two sons, ages 17 and 11. As the spouse of an educator, Cemal’s wife had the same special issue passport as he. When she sought a new one, the police told her that her husband had not returned to Turkey after the coup and that she was suspected of trying to flee the country. Martha was only five when she lost her mother to a grueling struggle with cancer and her childhood took on new challenges. For one, there was no permanent place to call home as she shifted from one relative’s place to another in her native central Ecuador. And attending school was nearly impossible since she was always on the move. “My life in my country was really hard,” she said. Eventually, she was sent to live with an aunt, a pharmacist in Guayaquil, Ecuador’s largest city about 100 miles away. It was yet another address change, a major one, but Martha was delighted. “I could go to school,” she said. She also worked, sometimes more than she wanted as a schoolgirl. From a young age, she put in long hours working after school in her aunt’s pharmacy. Nearly four decades later Martha is still studying and working. From July to September, she attended an intermediate English as a Second Language class at Berkeley College, a four-night per week class run jointly by the college and LVA. One of her goals is to become fluent enough to attend the nursing program at Essex County College, much like she did at a university in Ecuador. By most accounts, she’s made solid progress at the Berkeley ESL class. “It’s never too late to learn a new language,” she said. Martha said she’s dreamed of coming to the United States since she was five years old. When she eventually did, 15 years ago, the transition wasn’t the easiest. But she had help. Martha’s husband is a cook who works seven days per week. On school days he rushes home to care for their two sons, ages seven and 12, while Martha is still preparing sandwiches and making coffee at her job in a local restaurant. Her husband also watches the boys while she attends night classes. “He is my support,” Martha said of her husband. There’s no question, with work, raising children, and night classes, Martha’s schedule is exhausting. Martha, whose mantra since childhood has been “Anything is possible,” sees her struggles as part of achieving her dream. And she wants to make sure that the principles of hard work and achievement are passed on to her boys. A new state rule that doubles the minimum monthly hours of English instruction for students in adult education programs will present challenges for some, for sure. Others, like Maritza relish it. Maritza, a former child psychologist from Lima, Peru, meets with two separate LVA tutors for a total of four hours per week. She’s attended classes for eight hours each week at LVA’s program at Berkeley College in Newark. She enrolled in our English conversation group in Montclair. 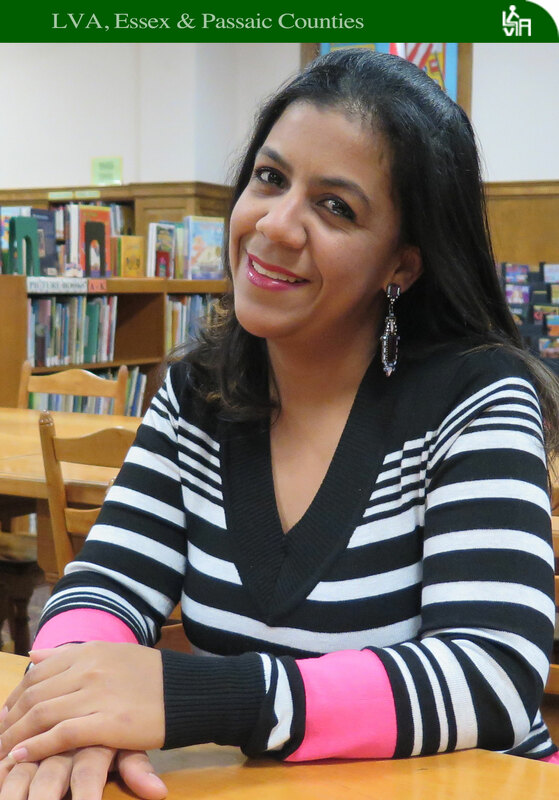 Maritza is a coordinator in LVA’s English-Spanish Language Exchange where Spanish-speaking students teach Spanish to tutors and tutors help them study English. And she meets weekly with an exchange member to put in an hour-and-a-half of English conversation practice. Maritza also gets to practice English as she volunteers at a local food pantry and once a week at the LVA administrative office. And that’s not all. It’s not unusual for Maritza to study English until 2:00 am or later, long after her classes end. 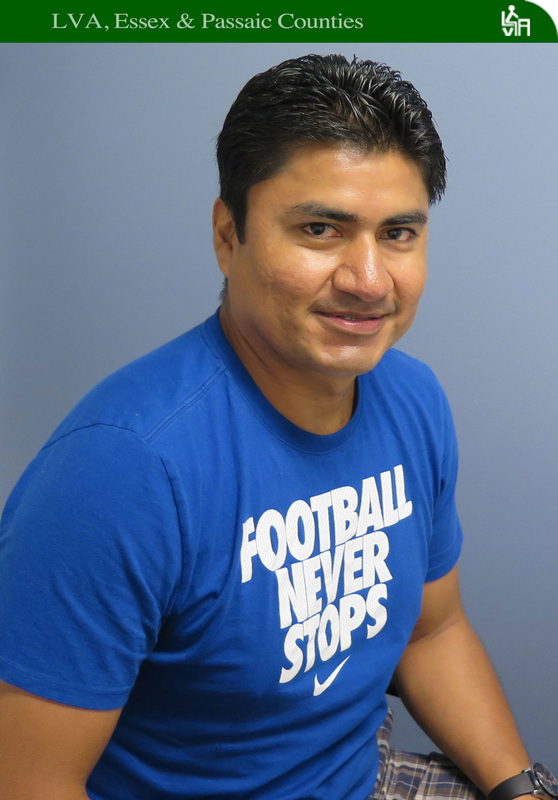 In only 9 short months since her arrival last July in the United States, Maritza has dramatically improved her English comprehension and pronunciation, including accent reduction. Future plans include passing the exams to become a licensed psychologist in New Jersey where she lives with her husband and two young daughters. Shortly after enrolling in their new school, Maritza’s daughters were told they could not stay in that school because of their limited English. “I was unhappy with this change because I knew the adaptation would be very hard for them. I felt very frustrated because I could not speak with the teachers and I knew this was not right for my girls,” Maritza said. In her daughters’ best interest, Maritza spoke to the Board of Education and also the principal. “I can communicate better in writing and we sent lots of emails back and forth,” she explained. As a result of her efforts, Maritza’s daughters were able to stay in their original school where they have nicely adjusted and made many friends. For LVA student Maribel, learning is truly a family affair. Her adult daughter, Yaritza, who accompanies Maribel to her weekly lessons, was born with arthrogryposis multiplex congenita (AMC), and feels driving her mother to the Bloomfield Library and ensuring she gets to her lessons is a way of showing appreciation for all Maribel has done for her. For some, this may seem an easy task, but it involves Maribel physically lifting Yaritza’s small frame into the driver’s seat of her specially designed car. Maribel came to LVA to learn to better communicate in English with Yaritza’s doctors. Maribel has a good understanding of the English language but has difficulty speaking English. 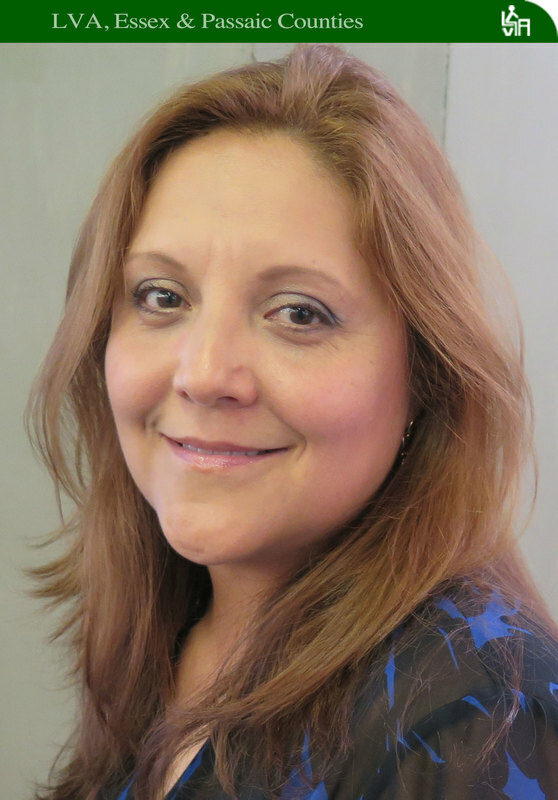 She developed her comprehension skills by sitting with her daughter in both her graduate and undergraduate courses where Yaritza studied social work. During their tutoring sessions, Maribel and her tutor Laura McLean, work on role-playing situations that may occur in everyday life. Their first task, of course, was to practice calling doctors. They also practiced identifying words, and using them in sentences. Fortunately, for all, they have moved on to calling theatres to find out when a show starts and restaurants to make reservations for dinner. Life has improved for both Maribel and Yaritza since they began with Laura less than a year ago. 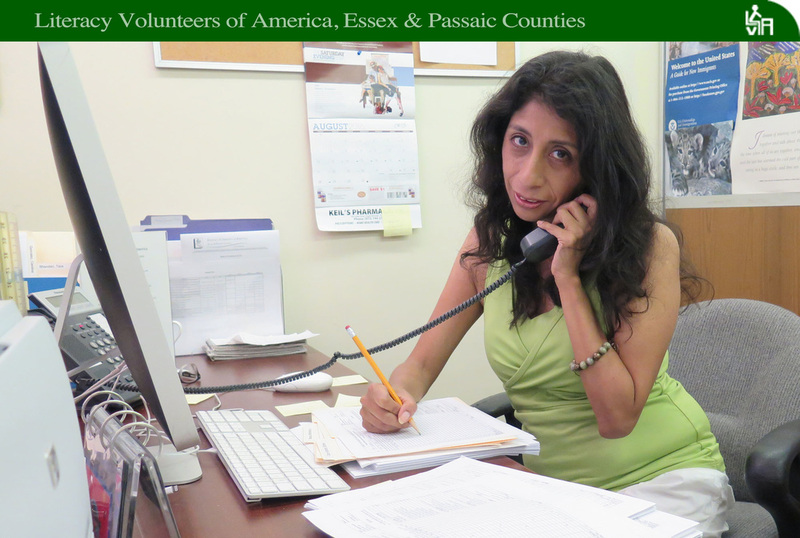 Maribel uses her English in the United States where she works as an au pair, a skill she first learned in Puerto Rico. She remembers her early years in her country where she helped her father run his farm. They grew yams, batatas, yucca, and mangoes. Maribel arranged and collected the fees for produce deliveries. Whether it is cooking, driving, or practicing English, Yaritza and Maribel have a very special bond.